Maintain two-way connectivity with the newsroom. A good example of the power of that two-way connectivity is the Tasks feature. Tasks makes GNXcapture a true extension of the normal newsroom functionality allowing newsroom management to include remote users in their planning. Back in the newsroom, editorial management use an event and task planner to keep track of up-and-coming events and to schedule editorial coverage. These tasks and assignments can be created and sent to staff and because GNXcapture functions as a true client to the GN4 content management system, users will automatically see their assignments when they log in remotely using GNXcapture. Just like when using a regular client into the system, tasks and assignments can be viewed, commented upon, progressed, accepted or rejected. 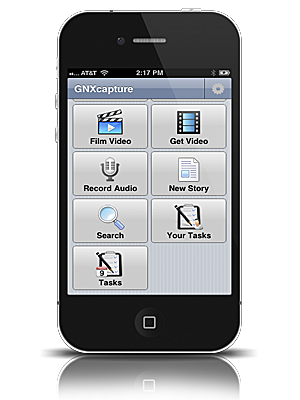 The Events, or rather, the Calendars where the events are listed, can be viewed by the GNXcapture app as well, so a remote user will always have access to the full context of his assignments. Content can be attached to tasks too, for example as background information, further enhancing the ability of newsroom staff to communicate clearly with remote users.